We travel across the lands exploring the best of what the place has to offer us. The scenic landscapes, historical marvels, and adrenaline rushing activities beckon us to travel far and wide to satiate our passion for travel. The Philippines is one such destination which has no dearth of wonderful tourist destinations. There is always more to islands and natural wonders that the country has to offer us. A great way to explore a country is like a local. And immersing ourselves into the local culture and learning their lifestyle is completely a new experience in itself. Hitting a cultural high will make a trip worth it and memorable in a true sense. If you plan to take a vacation to the Philippine islands, you can add the activities below to your itinerary to turn your journey into a priceless memory. Local Filipino street food is not only about the hotdogs or burgers sold at stalls on the side of the streets. Filipino is known for a wide variety of bizarre street food like barbecued innards of chicken and pork like “isaw” or intestine, “betamax” or cubed pork blood, “adidas” or chicken feet. There are also “kwek-kwek” or deep-fried breaded hard-boiled quail eggs and “tokneneng” which is basically the same except the egg is either chicken or duck. You may even have heard of “balut” or underdeveloped duck embryo. If you find these fascinating there’s much more to choose from likewise shown by When in Manila. Playing bingo brings out some of the fondest memories of childhood. And it’s amazing that bingo turns out to be one of the favorite Filipino pastimes. 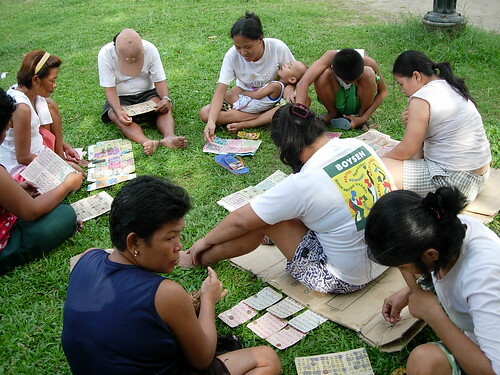 The popularity of Bingo in the Philippines is huge as one can find that it’s played in most part of the country’s streets and towns. It’s so popular that Inquirer reported that politicians even tried to use it as a tool for an electoral campaign, which is illegal of course. That being said, bingo in the Philippines is unlike anywhere else given that the locals have a distinct style of playing. The most curious are the humorous way the dealer declares each drawn number. Most of the numbers have their own word or phrase which correspond to their value. For example, when the dealer shouts “Highway!”, it means the drawn number is 54 due to the fact that Highway 54 is the old name of EDSA, the country’s most famous road. Another is “Merry Christmas!” which means 25, as the date for the occasion is December 25. It’ll be a lot of fun figuring out what each name means, and even some locals don’t initially understand every hilarious branding. Now that’s some real brain tickling fun. Due to bingo’s huge appeal, digital variants of the game have also gained traction over the years, both locally and globally. Providers like the local Leisure and Resorts World even plan to expand, according to Business World. Or for an alternative twist, there’s the bingo-slots combination Slingo that became popular in its own right in Manila. Through gaming portals such as Pocketfruity, which has several titles of the game including themed versions and tie-ups, Slingo is also spreading fun and excitement around the world. Nevertheless, there’s nothing quite like the classic, and playing it the Filipino way: hearing the ‘shaking’ sound of the basket, the funny pet names for numbers, and marking it on your bingo card. The Philippines, being a predominantly Catholic nation, has numerous festivals celebrated almost all year round. It only depends on the date and place you’re visiting. There’s Panagbenga or Flower Festival in Baguio, a month-long celebration from February to March; Masskara or Festival of Masks in the City of Smiles, Bacolod held every third weekend of October and; Sinulog Festival or Feast of Sr. Sto. Additionally, there’s Niño in Cebu every third Sunday of January. The last is the grandest festival in the country, as listed by The Top Tens. The colors of festivities of the country will rejuvenate and make for a memorable trip to cherish for a lifetime. Local cuisines to customs and festivities to the sights, everything is jolly, colorful and lively. Philippine festivals are the epitomes of the country’s rich culture. More importantly, though, while the celebrations are Catholic observances, everyone is very much welcome regardless of religious background and ethnicity. After all, everyone is there just to be happy and grateful. Have you been to the Philippines and experienced the varied culture they offer? What’s your favorite part of the Philippines visit? ← Titanic Belfast Experience in Belfast – All You Need to Know About a Visit! I have always wanted to visit the Philippines and this blog has inspired me even more. The street food looks fascinating – pork intestine sounds intriguing although I am not a massive fan of chicken feet! I never knew Bingo was a popular pastime, I use to play this in Spain every year so will deffo give this a go when we visit! I have always wanted to go to the Philippines, it is one of those places that’s been at the top of my list for years. I will definitely add these tips to my ever growing list especially the street food and the festivals. My brother and sister in-laws are chefs and when we go travel together, the first thing they want to do is indulge in local food especially street food. I haven’t heard of the “balut” but we had similar in Vietnam last year which was an underdeveloped chicken embryo, instead of a duck. I am a fan of Asian street food and I would try once all the bbq strange foods that I am not used to. I tried bugs in Vietnam and loved them. I hope to make it to the Philippines one day. I love street food but chicken innards are not going to be on my menu! I never knew Bingo was a thing there … Go figure! Oh wow the street food looks good – I am used to eat odd parts of the animals we usually eat. I love chickent feet, but never ate it cook differently from how the Chinese guys do it for Dim Sum… Balut is actually quite good, the vietnamese we eat that too occasionaly! Philippines is on my bucketlist and I would love to visit the place. It is interesting to see so many people playing Bingo…just the way people play cards in India! Did you learn to play the local way? Such an interesting way to play Bingo! It really makes it a thinking game compared to the more typical listening required. The street food looks amazing but I would not be one to experiment with the more exotic options, I’m afraid. We were just in Cebu and El Nido in May! We weren’t big on the food but the locals were super friendly. Our favourite part is what Mother Nature has done with Philippines- snorkeling off the house reef in Moalboal was amazing as that was our first time encountering sardine runs! Swimming with whale sharks in Oslob and island hopping in El Nido were definitely highlights too. The Philippines is unbelievably stunning! I haven’t been to the Philippines but I’ve only heard good things about it. I think I would be really bad at playing bingo because I wouldn’t know any of the code names….lol! Interesting though – thanks for sharing! I’m glad you enjoyed your visit! I’m from the Philippines and I must admit I haven’t had any of the bizarre street food you mentioned. I’m just way too scared to try them haha. Beaches are my favourite thing about the country. And the warm people. Now see I looked at the food and thought this I can eat, until you described what I would have been eating. Innards, I have to admit we did have some unusal foods down South as well. Maybe I would have to give it a try. I have never been to the Philippines but would love to visit one day. My friend went a few years ago and had a fabulous trip. I would love to go to the Philippines one day! There is a large population of Filipinos here in Norway and I always enjoy their cooking and hosting! Their hospitality is much like what I am accustomed to at home. That street food looks amazing! I’ve not yet visited the Phillipines but one day, fingers crossed, I hope to. I know one Phillipino and she kind of confirms all about their cheerful nature and hosting nature. If you can, go visit! Philippines is at the top of my list of places I’m dying to visit and you post is making me want to go there even more! The street food is very interesting. The Filipinos are proud of their culture and they are more than willing to share that to the tourists. It’s an amazing place! I would love to take in some of those festivals but I don’t think I could do some of the street foods you mentioned! Thanks for this post – very informative for when I get to the Philippines! Great post! I’ve never been to the Philippines before but think its a place I would really enjoy. Wow!! All pictures are just great! On my bucket list! Such a lovely place…looks very interesting! I’ve never been to Philippines but would definitely love to visit someday in my life! Glad to know that you guys enjoyed the destination like locals and explored amazing things! I have never been to the Philippines myself, but would love to go! They were once a Spanish colony, so they have more Spanish influence than most think. In fact I found a story a few months back that talked about all the ways Mexico and the Philippines are primos (cousins in Spanish). I suppose as someone who speaks Spanish and loves Hispanic culture, I’m very fascinated by this. That food looks amazing and I had no idea they loved bingo so much! I only visited the Philippines once when I was a kid. My mom is Filipino. We got to experience mostly Manila but a little of the countryside as well. I definitely prefer the countryside. I hope to visit again one day! Your post inspires me to do so! as a foodie, I have a feeling I would love the street food there, oh and the festival looked so colorful! I have not made it to any country in Asia, have been all over Europe and the US so far, but I hope that one day, I get a chance to see the Philippines. Blessings! So, my brother’s girlfriend is from Philippines and I am pretty sure to say they are not splitting anytime soon so I think visiting Philippines is something that will happen to me eventually. I would love to visit it since I heard so much about it and those festivals look like a tone of fun! Lovely post! So colorful!! ..Philippines is on my bucket list! Will bookmark your post for that! I’ve never visited the Philippines but the bingo one made me lol! What a unique way to play it! I love indulging in local street food wherever I go! Great post!